This lesson is intended to be a walk-through for adding MET Representatives and inputting dates of parental consent, evaluation targets, and extensions. Click the Key Dates tab in the Sub-navigation Toolbar. Tip: You may enter just a few letters of the MET representative's name and a drop down list with the available evaluator's names will appear. Once you have located the evaluator's name roll over it and click. 2. Use the Date Picker Icon to select the Date District Received Parental Consent. 3. 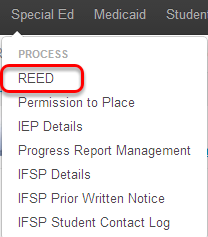 Use the Date Picker Icon to select the Original 30 Day Target Date for this Referral (REED). Note: The 30 Day Timeline ONLY applies to initial evaluations. 4. After entering your key date information, click Save. 2. After you are finished entering Key Dates you are ready to move on to Evaluation Logs. To proceed, click on the Evaluation Logs tab in the Sub-navigationToolbar. Note: Please refer to the "Edit Referral (REED) Evaluation Log" lesson in the "Referral (REED)" manual for more information on how to log evaluation information. Due Dates/Created Dates on the REED Widget: Where do these pull from?